Local architecture buffs will have the unique opportunity to see all five proposalsnot just the winning proposalin the competition to design the visitors center for the Darwin Martin House, thanks to the work of a UB architecture professor and seven graduate students. The students, working with Kent Kleinman, professor and chair of the Department of Architecture in the School of Architecture and Planning, are putting together a special exhibition at the Albright Knox Art Gallery, "Mori on Wright: Designs for F.L. Wright's Martin House Visitor Center." Architecture students, working in the basement of Cosby Hall on the South Campus, examine the site model they are constructing of Toshiko Mori's winning proposal for the visitors center for the Darwin Martin House. The exhibition will open with a presentation on Oct. 18 by Toshiko Mori, whose design won the competition, and a lecture on Oct. 19 by Robert Campbell, architecture critic for The Boston Globe. These lectures, part of the School of Architecture and Planning's Fall Lecture Series, will take place at the Albright Knox. There is an admission charge to attend the lectures, which are open to the public. Next month, Mori will return to Buffalo, along with the other four architects that competed for the visitors house commission, to attend a symposium on Nov. 8 at the Albright Knox on lessons learned from the competitionan event that Kleinman says is rare in the architecture world. A member of the board of the Martin House Restoration Corp. who sat on the architect selection committee for the visitors center project, Kleinman was asked by the corporation board to curate the exhibition, which, he says, involves designing the exhibition and some of the exponents, and "giving some conceptual and visual coherence to what is, in fact, five different schemes for the same program." 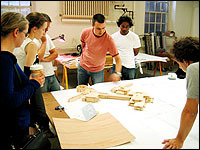 The students, who are working on the exhibition as part of an independent study project with Kleinman that began in the summer and continues this semester, are involved in all aspects of the project, from designing and building the site models and the infrastructure for the display system to specifications, costing out the project and budgeting. Kleinman notes that during the architect selection process, all five firms in the competitionSchwarz/Silver, Toshiko Mori, Office dA, Brian Healy and Architecture Research Officehad presented their proposals to the competition jury by placing an insert piece with their design for the visitors center into a large site model of the Martin House. One of the challenges the UB team faced in creating the exhibition and showing all five schemes was that there weren't five individual site models. "Without the site model, you really can't judge the merits of the individual schemes," Kleinman says. So the students built new, identical, high-grade site models for all five schemes, offering the public "a pretty rare opportunity to see five schemes in precisely the same contextwith the same trees and with the same level of detailso they can look for themselves and compare these different schemes." The infrastructure for the display system for the five proposals envisioned by the students was "fairly ambitious" as well, Kleinman says, describing a system in which all of the work is suspended from a 6-inch-wide steel rail that is mounted "like a new horizon line" along the wall in the exhibition room. The site models will cantilever off that"nothing touches the ground; nothing touches the walls," a motif inspired, he says, by Mori's design, in which "structure appears to defy gravity." Kleinman notes that those viewing the exhibition will see the site models and architectural drawingswhich will be mounted along the wall above the modelsthat the architects presented to the competition jury. The students also are putting together another model of Mori's visitors center scheme using a new technique that Kleinman declined to discuss in detail during a recent interview because the work was still in process. He says he hopes the new model will be ready in time for the Nov. 8 symposium. Working on the visitors center exhibition has offered students a "unique learning opportunity," he points out. "The opportunity to work with these five architects about their proposalsspeaking with these extraordinary architects and establishing that connectiondesigning an exhibition in a top-flight cultural institution, dealing with budgets and trying to fabricate all the bits and pieces, and getting it installed on time and on budget has been pretty challenging and a good education for them," he says. Contrary to the conventional wisdom, getting all five architects to come back to town for the symposium was not difficult, Kleinman says. "We went to a lot of effort to make sure that their work is represented very beautifully in this show. That's unusual. Normally if you don't win (a design competition), you're outno one wants to see the work that didn't win," he says, pointing out that such exhibitions usually just feature the winner's design. "Instead, (the Albright Knox exhibition) is a somewhat daring, curatorial concept to bring the public into the process (even though the winner has been selected), to show the public just how interesting the architectural ideas that are out there really are, and celebrate them." The architects, he says, are "pleased with us that we chose to keep their work alive and show it to the public." Kleinman points out that the exhibition and symposium jibe intellectually with both his own personal and professional agenda and that of the Department of Architecture; that is, "to show the community the high quality of contemporary architectural thinking and how it can connect to the city's historic fabric. Preservation and really adventurous new architecture are not at all at odds and they can speak to each other, even across 100 years." The architects in the Martin House competition each proposed a different solution to the design question, Kleinman says, "all of them incredibly sensitive to context and history. This (exhibition) is a rare opportunity to see that."